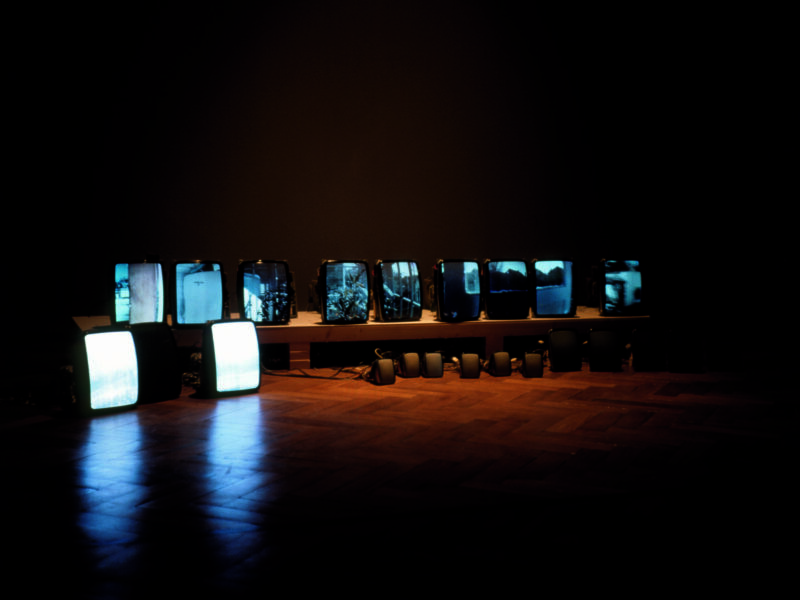 Between Cinema and a Hard Place consists of twenty-three video monitors of various sizes stripped of their housings and positioned “haphazardly” on top and in front of a low platform, a formation akin to a deteriorating row of loosely piled stones typically seen dividing parcels of land. Nine 13-inch color monitors are positioned loosely in a line on the temporary construction made of sheetrock and wood. In front of and to the left of this grouping are three more 13-inch color monitors that are slightly angled to face a centrally located viewer. Positioned centrally on the floor are six 5-inch black-and-white monitors, and to the right of those are five 9-inch black-and-white monitors also in a loosely defined line. Images from three sources are routed to twenty-three outputs via a computer-controlled video switching matrix. At times the same and/or different images can be seen on any number of monitors and sometimes on no monitors at all. The images consist of farmlands, fences and telephone poles passing by as seen from a car, details of a modest house and a particular sequence of domestic activities – quartering an apple, folding clothes, digging the garden, washing hands and tending plants. They are composed around a spoken text, an adaptation of Martin Heidegger's The Nature of Language, that questions a strictly parametrical view of space and time, posing the possibility of a "neighboring nearness" that does not depend on spatial-temporal relation. By reinterpreting the text within a cinematic context that utilizes the same parameters being thrown into question – time-sharing images as well as spatial and proportional placement of images – the work attempts to incise the structural apparatus of cinema as it measures philosophical issues against the visceral nagging presence of the everyday. Heidegger's use of nature as a metaphorical place of thought is called into question with images of landscapes and pastoral scenes being interrupted by variable fencing, posted signs, and other interventions of "spatial-temporal" limits. This work also exists in a German language version (1994), that can be used alternately. 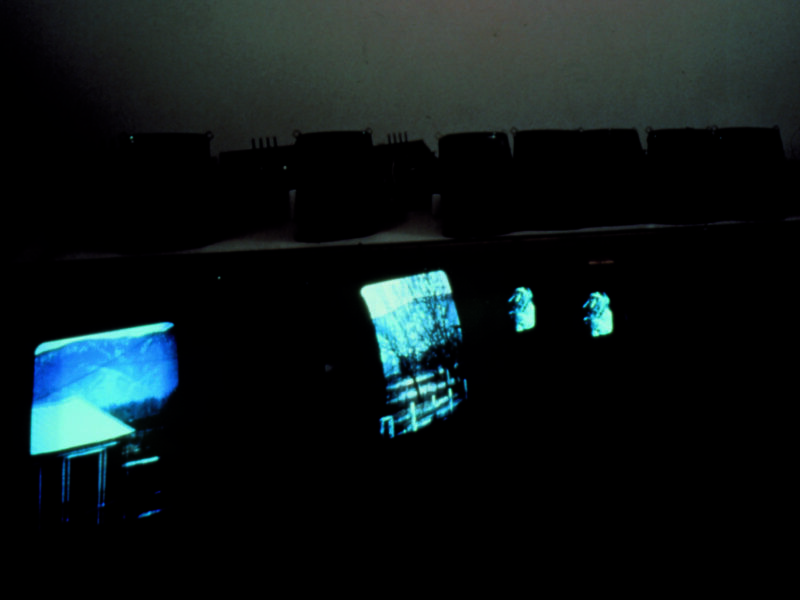 An example of this work was exhibited for the first time at the Whitney Museum of American Art, New York, New York, April 2 – June 16, 1991 as part of the 1991 Biennial Exhibition. OCO Espace d’art contemporain, Paris, France, September 20 – November 2, 1991. Artec ’91 Second International Biennale, Nagoya, Japan, October 10 – November 17, 1991. “Dance,” California Museum of Photography, Riverside, California, February 14 – April 5, 1992. “Gary Hill, Between Cinema and a Hard Place, and recent works by Lewis Baltz, Jac Leirner, and Glenn Ligon,” The Bohen Foundation, New York, New York, June – October 1993. “Gary Hill,” (travelling exhibition organized by the Henry Art Gallery, University of Washington, Seattle, Washington), Henry Art Gallery, University of Washington, Seattle, Washington, June 10 – August 14, 1994; Museum of Contemporary Art, Chicago, Illinois, September 24 – November 27, 1994; Museum of Contemporary Art, Los Angeles, California, December 19, 1994 – March 12, 1995; Guggenheim Museum SoHo, New York, New York, May 11 – August 20, 1995; Kemper Museum of Contemporary Art and Design, Kansas City, Missouri, October 14, 1995 – January 14, 1996. Busch-Reisinger Museum, Harvard University Art Museums, Cambridge, Massachusetts, March 11 – September 17, 1995. 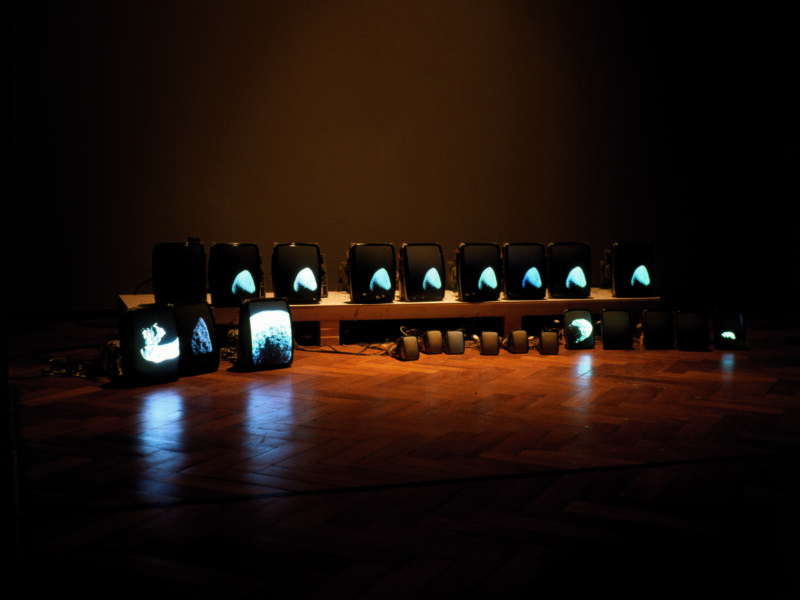 “Between Cinema and a Hard Place,” Tate Modern, London, England, May 12 – December 3, 2000. 1991 Biennial Exhibition. New York: Whitney Museum of American Art, 1991, p. 378. Larson, Kay. “Art: A Shock to the System.” New York (April 29, 1991), p. 87. McEvilley, Thomas. “New York: The Whitney Biennial.” Artforum (Summer 1991), p. 100. Dance! Program notes. Riverside, California: California Museum of Photography, 1992, pp. 3, 4. (Including the artist’s description of Between Cinema and a Hard Place, 1991). Sarrazin, Stephen. Chimaera Monographe No. 10 (Gary Hill). Montbéliard, France: Centre International de Création Vidéo Montbéliard, Belfort, 1992, pp. 8, 9, 44 – 47, 59, 82, 83. (Including excerpts from a preface by Gary Hill and an interview with Gary Hill). Van Assche, Christine. Gary Hill. Paris: Editions du Centre Georges Pompidou, 1992, pp. 6, 11, 12, 25, 46, 47, 50. (Including excerpts from Gary Hill, “Inter-view”). Sarrazin, Stephen. "La parole aux objets." art press 165, France (January 1992), pp. 22, 23. Mignot, Dorine. Gary Hill. Amsterdam: Stedelijk Museum; Vienna: Kunsthalle Wien, 1993, pp. 15, 17, 57 – 63, 77, 101. (Including excerpts from Gary Hill, “Inter-view”). Braet, Jan. “Schepen in de nacht.” KNACK (September 15, 1993), p. 132. Murin, Preložil Michal. “Gary Hill.” Profil. Súcasného Výtvarného Umenia (December 1993), p. 29. Bruce, Chris. Gary Hill. Seattle, Washington: Henry Art Gallery, University of Washington, 1994, pp. 67, 85, 86. Vogel, Sabine B. “Im Licht des Monitors Gary Hill.” Artis (December 1994/January 1995), pp. 46, 47. Kandel, Susan. “Gary Hill: Museum of Contemporary Art, Los Angeles.” Artforum 33, 8 (April 1995), p. 86. Beckmann, Angelika. “Gary Hill.” European Photography 58, 16, 2 (Fall 1995), pp. 63, 64, 67. Villaseñor, Maria Christina. “Bound Spaces.” Art Journal 54, 4 (1995), p. 5. Suchère, Eric. “Gary Hill Le Trafiquant d’ Images.” Beaux Arts 142 (February 1996), p. 68. Quasha, George and Charles Stein. Tall Ships. Gary Hill’s Projective Installations 2. Barrytown, New York: Station Hill Arts, 1997, p. 41. Quasha, George and Charles Stein. Viewer. 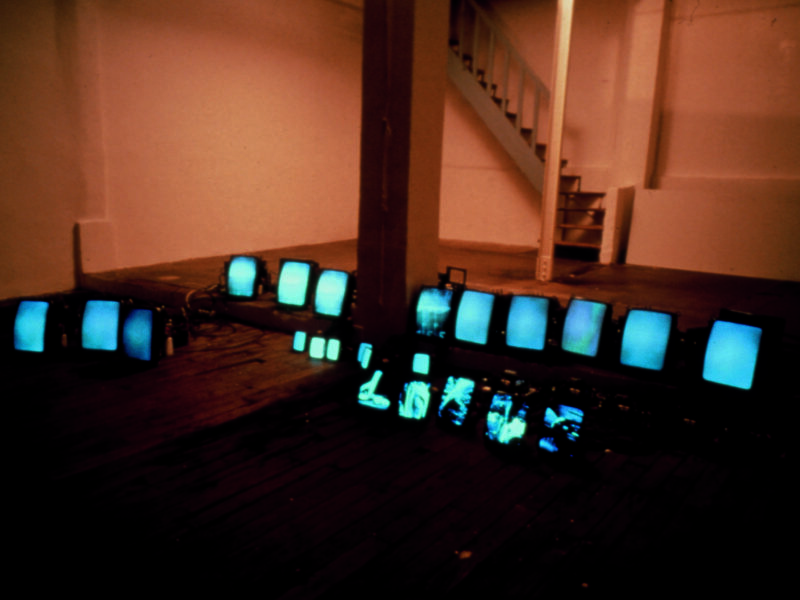 Gary Hill’s Projective Installations 3. Barrytown, New York: Station Hill Arts, 1997, pp. 53, 54. Liesbrock, Heinz. Gary Hill: Midnight Crossing. Münster: Westfälischer Kunstverein, 1997, pp. 17, 103. The Multimedia and Cultural Revolution. Tokyo: NTT Intercommunication Center, 1997, pp. 131, 134. Stals, José Lebrero. Gary Hill: HanD HearD – Withershins – Midnight Crossing. Barcelona: Museu d’Art Contemporani de Barcelona, 1998, pp. 14, 46. Chung, Yong-do. “Gary Hill: New Art Language Marking History of Reason. ” Art, Korea (October 2000), p. 142 (in Korean). Morgan, Robert C., ed. Gary Hill. Baltimore: PAJ Books / The Johns Hopkins University Press, 2000, pp. 38 – 40, 87 – 89, 120, 139, 140, 221, 222, 294 – 295, 297. Gary Hill en Argentina: textos, ensayos, dialogos. Buenos Aires: Centro Cultural Recoleta, 2000, pp. 43. Between Cinema and a Hard Place. (London: Tate Modern, 2000), unpaginated. Gary Hill: Instalaciones. Córdoba: Ediciones Museo Caraffa, 2000, pp. 15, 22, 54. Lageira, Jacinto. Des premiers mots aux derniers silences in Gary Hill: Around & About: A Performative View. Paris: Éditions du Regard, 2001, p. 14. Quasha, George and Charles Stein. La performance elle-même in Gary Hill: Around & About: A Performative View. Paris: Éditions du Regard, 2001, pp. 73, 101. Gary Hill: Selected Works and catalogue raisonné. Wolfsburg: Kunstmuseum Wolfsburg, 2002, GHCR 66, pp. 13 - 14, 20, 24 - 26, 32, 38 - 40, 150 – 152, 177. Barro, David. Gary Hill: Poeta da percepção, poet of perception, poeta de la percepción. In Portuguese, Spanish and English. Porto: Mimesis, 2003, pp. 9, 11, 15 – 16, 31, 33, 37, 53, 55, 59. Perry, Gill and Paul Wood, eds. Themes in Contemporary Art. New Haven: Yale University Press / The Open University, 2004, pp. 6, 34. Odin, Paul-Emmanuel. L’absence de livre [Gary Hill et Maurice Blanchot – Écriture, vidéo]. Marseille: La Compagnie, 2007, pp. 148, 205. Spielmann, Yvonne. Video: The Reflexive Medium. Cambridge: The MIT Press, 2008, pp. 249 (photo only). Quasha, George and Charles Stein. An Art of Limina: Gary Hill’s Works and Writings. Barcelona: Ediciones Polígrafa, 2009, pp. 37, 40, 389, 396, 407, 521, 570. Douglas, Stan and Christopher Eamon, eds. Art of Projection. Ostfildern: Hatje Cantz Verlag, 2009, pp. 142 – 143. Gary Hill: Viewer. Moscow: GMG Gallery, 2010 (in Russian and English), pp. 28, 29. Note: The spoken text is an excerpt, reworked by the artist, from “The Nature of Language” in On the Way to Language by Martin Heidegger (Harper San Francisco, a division of Harper Collins 1971, pp. 101 – 104). German version: “Das Wesen der Sprache,” in Unterwegs zur Sprache by Martin Heidegger (Pfullingen 1959, pp. 208 – 211). When the word is called the mouth's flower and its blossom, we hear the sound of language rising like the earth. From whence? From Saying in which it comes to pass that World is made to appear. The sound rings out in the resounding assembly call which, open to the Open, makes World appear in all things. The sounding of the voice is then no longer only of the order of physical organs. It is released now from the perspective of the physiological-physical explanation in terms of purely phonetic data. The sound of language, its earthiness is held with the harmony that attunes the regions of the world's structure, playing them in chorus. This indication of the sound of speaking and of its source in Saying must at first sound obscure and strange. And yet it points to simple phenomena. We can see them once we pay heed again to the way in which we are everywhere under way within the neighborhood of the modes of Saying. Among these, poetry and thinking have ever been preeminent. Their neighborhood did not come to them by chance, from somewhere or other, as though they, by themselves, could be what they are even away from their neighborhood. This is why we must experience them within, and in terms of, their neighborhood, that is, in terms of what determines that neighborhood to be a neighborhood. Neighborhood does not first create nearness; rather, nearness brings about neighborhood. But what does nearness mean? As soon as we try to reflect on the matter we have already committed ourselves to a long path of thought. At this point, we shall succeed only in taking just a few steps. They do not lead forward but back, back to where we already are. The steps do not form a sequence from here to there, except--at best--in their outward appearance. Rather, they fuse into a concentration upon the selfsame thing, and wend their way back to it. What looks like a digression is in fact the actual proper movement on the way by which the neighborhood is determined. And that is nearness. When we intend nearness, remoteness comes to the fore. Both stand in a certain contrast to each other, as different magnitudes of our distance from objects. The measurement of magnitude is performed by calculating the length or shortness of intervening stretches. The measurements of the lengths so measured are always taken according to a yardstick by which, along which, the number of units in the measured stretch is counted out. To measure something against something else by moving along it is called in Greek parametrein. The stretches along which and past which we measure nearness and remoteness as distances are the temporal sequence of "nows,”that is, time; and the spatial side-by-side (beside, in front, behind, above, below) of the points here and there, that is, space. To the calculating mind, space and time appear as parameters for the measurement of nearness and remoteness, and these in turn as static distances. But space and time do not serve only as parameters; in this role, their nature would soon be exhausted. What is it here that makes us uneasy? The fact that in this way the nearness to which neighborhood belongs can never be experienced. If nearness and neighborliness could be conceived parametrically, then a distance of the magnitude of one millionth of a second, and of one millimeter, would have to mean the nearest possible neighboring nearness, compared with which even the distance of a yard and a minute represents extreme remoteness. Even so, we are bound to insist that a certain spatial-temporal relatedness belongs to every neighborhood. Two isolated farmsteads separated by an hour's walk across the fields, can be the best of neighbors, while two townhouses, facing each other across the street or even sharing a common wall, know no neighborhood. Neighboring nearness, then, does not depend on spatial-temporal relation. Nearness, then, is by its nature outside and independent of space and time. This view, however, would be premature. We may say only this: that the nearness which prevails in the neighborhood does not depend on space and time considered as parameters. If we assume that the parameters space and time furnish the standard for neighboring nearness, and thus bring about nearness itself, then they would have to contain even within themselves what distinguishes neighborliness: to be face-to-face with one another. We tend to think of face-to-face encounter exclusively as a relation between human beings. Yet being face-to-face with one another has a more distant origin; it originates in that distance where earth and sky, the god and man reach one another. This is not only with respect to human beings but also with respect to things of the world. Where this prevails, all things are open to one another in their self-concealment; thus one extends itself to the other, and thus all remain themselves; one is over the other as its guardian watching over the other, over it as its veil.